It's been a while since the last shout out to a blog follower's own blog, so let's fix that oversight! Today's profile features '59 Topps, a card-by-card profile of Commishbob's complete 1959 set. 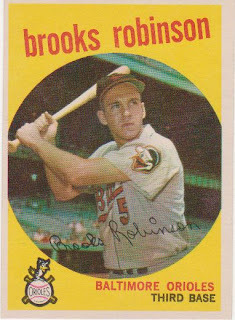 Commishbob started blogging this set on Feb 13 with his favorite player, #472 Brooks Robinson. Each post discusses a card and what he remembers of the player or team. Here's a key piece for Brooks. As I mentioned Brooks is my favorite baseball player. My twin sons are named for him and Jim Palmer. We've met Brooks several times and he's as nice as his reputation. When a small story appeared in the Baltimore Sun about my sons carrying the names of Oriole stars Brooks came up with my address and sent us signed pictures. Brooks also holds a special place in my heart as the first guy to reply to questions I sent as a 13 year-old back in 1985. (Scan of his answers in my 1973 Johnny Pro Orioles profile.) Plus, he wore uniform #5--win/win. Commishbob is a blogging machine, clocking in at 113 card profiles since that first February post. Check out '59 Topps for more! Thanks for the nod, Matthew. I've been enjoying your posts for awhile. Nice way to see a variety of card issues, some for the first time.